The family members of shooting victims who launched a campaign called "No Notoriety," aimed at discouraging news coverage of mass murderers, are starting to feel like they're succeeding. There has been a noticeable pullback in the amount of press attention being given to gunmen, most recently after Thursday's massacre at Umpqua Community College in Oregon. A roiling debate is happening in newsrooms about how often to say the names and show the faces of mass shooters — or whether to do so at all. As she watched the Oregon shooting coverage in Denver on Friday morning, Sandy Phillips noticed that she hadn't seen any photos of the shooter. She reached for her cell phone and texted Caren Teves in Phoenix: "#NoNotoriety is making a difference." Teves had noticed the same thing. "I'm feeling slightly victorious this morning," she said in a phone call. The two women are linked by loss. Phillips' daughter Jessica and Teves' son Alex were both killed in the attack at an Aurora, Colorado, movie theater in 2012. The Phillips and Teves families were confronted by the killer's face and photos many times in the days, weeks and months that ensued. In January, Caren and her husband Tom Teves started No Notoriety to challenge news media norms. Phillips and her husband Lonnie joined them. The group praised journalists like CNN's Anderson Cooper and Denver anchorman Kyle Clark who had already taken a position against naming mass shooters. And they urged other journalists to do the same. "Limit the name and likeness of the individual," their web site recommends. "Refuse to broadcast/publish photos and/or self-serving statements made by the individual." The No Notoriety challenge also pressed journalists to "recognize that the prospect of infamy could serve as a motivating factor for other individuals to kill others and could inspire copycat crimes. Keep this responsibility in mind when reporting." The suggestion that mass killers are often seeking fame has been supported by numerous studies. But there are a variety of counterarguments, starting with the fact that journalists have a duty to document incidents in great detail. There is an inherent assumption that having more information about a killer could help stop future shootings. Reporter Garrett Haake, of the Washington, D.C. station WUSA, wrote Friday, "Facts matter to an informed debate. When law enforcement fails to provide the facts, or journalists fail to report them, we cheat ourselves out of the hard debates and discussions that should follow such appalling violence." Furthermore, The Washington Post's Erik Wemple wrote, "Journalists cannot make their calls based on notions that may be swimming in the minds of the insane." This debate played out in prime time on Thursday. CNN's Don Lemon said during his 10 pm program that "we must identify him, because that is our job." Megyn Kelly, the 9 pm host on Fox News, tweeted her disagreement — "print media can" name him, she wrote, but "TV gives infamy he [probably] desired. Don't!" There are signs that major news organizations are edging closer to No Notoriety's position. While the Friday morning newscasts on NBC, ABC and CBS all said the Oregon gunman's name — Chris Harper Mercer — and showed his picture, none of the stories lingered on him. During CNN's coverage of the massacre on Friday, his name was uttered only occasionally and his face was never shown. These are daily editorial decisions, not a matter of established policy. And the decisions are continuing to evolve. But there is a discernible difference even when compared to the 2014 shooting near the University of California, Santa Barbara last year. Partly this is because there's evidence, both in Oregon and in the murders of two WDBJ journalists in Virginia in August, that the killers specifically craved media attention. The WDBJ killer opened fire when the news crew was live on TV, and he recorded the attack with his own camera. A blog post believed to be written by Mercer in August specifically cited the WDBJ shooter. "I have noticed that so many people like him are all alone and unknown, yet when they spill a little blood, the whole world knows who they are," the blog post said. "Seems the more people you kill, the more you're in the limelight." Phillips said in a telephone interview that she is glad "that's not happening" in this most recent case. She suggested that the deaths of the two WDBJ journalists had influenced decision-making in other newsrooms: "They're beginning to understand that we do not want to make these people infamous." Growing social media campaigns have also sought to put the focus on the victims of shooting sprees and the heroes who saved lives rather than the perpetrator. The phrase "Forget Oregon's Gunman" was trending on Twitter at noon Eastern Time on Friday. Some public officials have encouraged this, too. 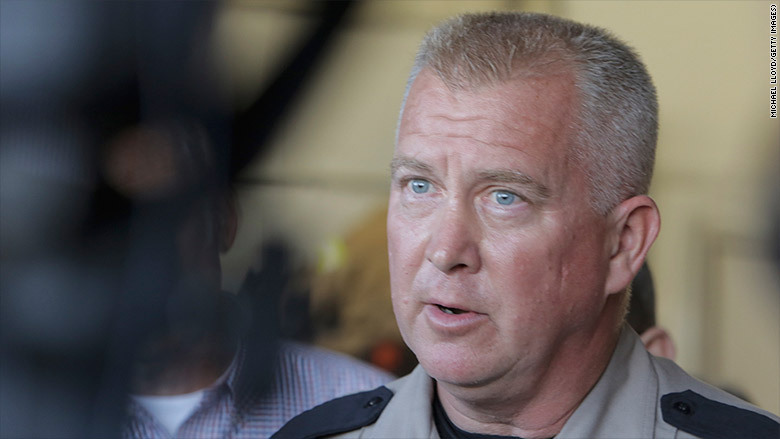 On Thursday night Douglas County Sheriff John Hanlin pointedly said he would never utter the Umpqua gunman's name. "I continue to believe that those media and community members who publicize his name will only glorify his horrific actions," he said at a followup press conference Friday. "And eventually this will only serve to inspire future shooters." Tom Teves said in a phone interview that he is not advocating for mass shooters' identities to be blacked out altogether. It's about proportionality: Report the name, then move on; don't plaster the person's face all over the TV screen and the home page. "We need to study these individuals -- report the facts, report what the motivation was," he said. "But we don't have to use their name." Like his wife, he said he sensed progress toward their cause. But then Caren quickly added: "We're not there yet." The Teves will speak more about this on CNN's "Reliable Sources," Sunday at 11 a.m. Eastern Time.